Up for sale is a used but mechanically perfect Middleburn RS8 Duo chainset. 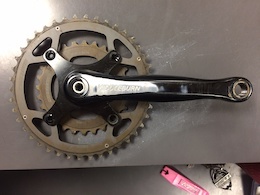 This crankset retails for £333.50 on Leisure Lakes Cycles (http://www.leisurelakesbikes.com/p/16947/middleburn-rs8-x-type-duo-chainset) and many other on-line sites, so grab yourself a bargain for £120.00 Middleburn cranks are often sought after for their high strength and robustness as well as their traditional, classic looks. They are proudly made in the United Kingdom. This example has wear to both arms in terms of the black anodising wearing away, but in terms of function they are perfect. Both chain-rings have plenty of wear left on them and are a testament in themselves to the reputation of quality and longevity that Middleburn have aquired. The crank arms measure 175mm in length and the rings supplied are 42/28t. I am aware that in the photo there is a missing chain-ring bolt; this has been replaced and all bolts are present and correct. The cranks do NOT include the Bottom Bracket; however they are compatible with Shimano Hollowtech II, Hope, Chris King etc... If you have any further enquiries, please feel free to message me on here or via the number supplied. 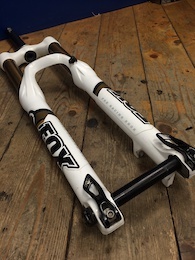 Fox Float CTD Factory Series Shock - In excellent, but used condition. The shock received a seal and foam ring service less than 10 riding hours ago and is mechanically flawless. Selling due to the purchase of a new rear shock and no longer require this as a spare. Kashima Coated Shaft CTD (Climb, Trail, Descend) Compression Adjustment. 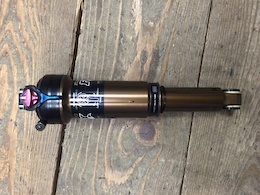 Rebound Adjustment Rebound Tune 'L' Boost Valve Tune '225' Velocity Tune 'L' Dimensions: Eye to eye - 8.5" (261mm) Shock Stroke - 2.5" (63mm) Comes complete with mount hardware for a Yeti SB66 RRP: £400.00 Asking Price: £150.00 Please feel free to contact me on the number provided for any information and inquiries. Fox Float 36 RLC - 2012 - In used, but excellent condition and perfect working order. They received a lower leg service 10 hours or so of riding ago and are in excellent internal condition. Selling due to the purchase of new forks and do not require these as spares. 160mm Travel 20mm Bolt Through Axle Kashima Coated Uppers Rebound Adjustment Low Speed Compression Adjustment Lock-Out / Lock-Out Force Adjustment 1 1/8" Steerer - Supplied with Hope Technology 1 1/8" to 1.5" crown conversion for tapered headsets and frames. Steerer Tube Length: 220mm RRP: £959.99 Asking Price: £300.00 Please contact me on the number provided with any inquiries! Up for sale is my beloved, but sadly rarely used NS Majesty. It is in excellent condition throughout and has been maintained professionally (I am a CyTech trained Bicycle Mechanic) since purchase. I rarely find time to ride due to work, and the bike is sat unused in my hallway. This is a fine example of one of the most highly sought after dirt jump bikes on the market, and as such has been built to the highest specification. Full Specification: NS Majesty Frame Matte/Gloss Black - Integrated Headset and Spanish BB Fox Racing Shox 36 Float R (lowered to 100mm travel) - 20mm Bolt Through Mavic EX721 Rims, NS Rotary PRO Hubs and DT Swiss double butted spokes Intense Micro Knobby Tyres Profile Racing Cranks w/Federal Street Sprocket Charge Masher Half link Chain Macneil Pivotal Saddle and United Seatpost Thomson Elite X4 Stem Sunline V2 Handlebars (710mm/uncut) ODI Stay Strong Lock-on Grips WeThePeople Headset Avid Juicy 7 Rear Disc Brake Shimano DX Pedals In total this bike cost roughly £2500.00 to build, and given its excellent condition I am seeking sensible offers in the region of £800.00. NO SWAPS, NO TRADES. Please feel free to ring/text me on the number provided. Many thanks for viewing. 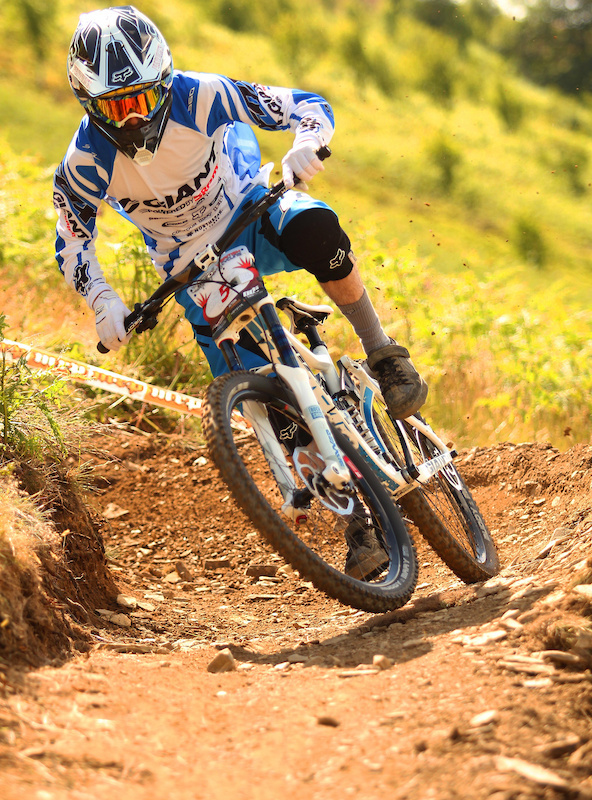 Pinkbike's Burning Question - Should You Support Your Local Bike Shop or Buy Online? ...And stop deleting my post.